It Has Begun. – Life Is Such A Sweet Insanity. Kamala Harris at the CNN Town Hall, Monday, January 28, 2019. Presidential hopeful Kamala Harris kicked off “town hall” season last night in Des Moines, Iowa last night. The event was broadcast on CNN. Last night’s showing drew record ratings, earning the largest numbers for a single candidate town hall in the history of the network news channel. It was refreshing to hear someone speaking in a presidential manner on a cable news channel. 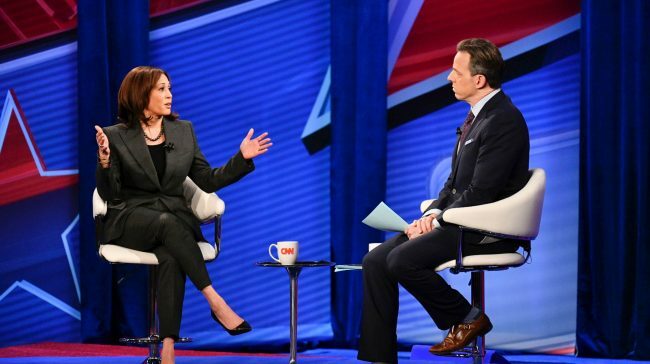 This type of discussion, where she touched on policy points around immigration, health care, border security, and many other subjects, has not happened in the last two years. It was great to take a step away from the constant chaos from the idiot currently in the White House. She made me feel hopeful. Remember what ‘hopeful’ feels like? I like what I know about Kamala Harris. I love her confidence, I’m comfortable with the way she presents herself, and I found her ways of expressing herself to be compatible with the way I think. I’m still reading up on her ideology and where she stands on key policy points, but I was 95% with her on what she discussed during last night’s broadcast. I’m looking forward to learning about the other candidates putting their hats in the ring. It’s important to read data from reputable sources and to learn as much as we can about our leaders. I want to feel good about them, yes, but I also want to know where they stand and how they plan to achieve the goals they have for leading the country. The 2020 election cycle has begun. Are you ready for the ride? John Chancellor: Peril and Promise.